If you clicked on this article, we’re guessing you didn’t win the Powerball jackpot and have to save up for your dream trip the old fashioned way. Travel can be wonderful and life changing, but even with all the great deals and last-minute sales out there, there is no denying how expensive it is. Dream vacations do not come cheaply and saving money for flights, accommodations, excursions, food, and other expenses takes focus, determination, and a little bit of sacrifice. Stick to these money-saving strategies and you’ll find yourself with enough cash to turn your travel fantasies into realities. Getting organized is the first step to saving money. Taking a look at your income and spending habits will help you visualize where your money is going, which makes it easier to see where you can cut down on spending. There are a lot of little luxuries you can buy to make your day easier, but if you’re trying to save for your dream trip you’re going to need to cut down. This is the time to prioritize what you really need compared to what you really want. If you have trouble turning yourself down, just think about how worthwhile it will be when you’re finally on your trip. What’s a latte at Starbucks compared to an authentic cappuccino in Italy? If you need money for a trip, it’s time to take a look around your house and figure out what you don’t need anymore. From old books to clothes that don’t fit anymore, you can sell basically anything these days and you don’t have to just stick to yard sales and second-hand stores. Thanks to the Internet, selling your stuff has never been easier. Take a look at Tradesy for selling clothes and Amazon for selling books. If you can’t trust yourself to manage your own travel budget, you should look into creating an account specifically for your travel budget. This will help you figure out how much money you have for your trip. We recommend using websites like SmartyPig to set up an automatic deposit system. 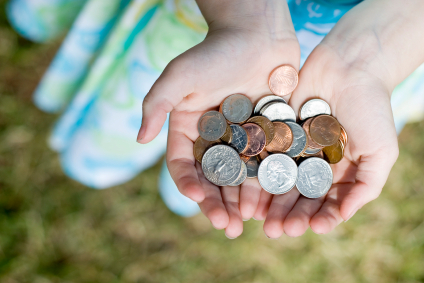 Pocketing your change is a great way to save up money, but let’s face it, coins don’t add up to much anymore. If you want your piggy bank to make an impact on your travel budget, you’ll have to start saving the big bills too. You’ll be surprised how quickly dollar bills add up when you start saving them for travel. It might seem counterintuitive to spend money when you’re trying to save money, but the right credit card can turn your daily expenditures into airline miles. Certain cards include sign-up bonuses that will reward you in miles as long as you spend a set amount of money within the first few months. If you’re not planning on traveling frequently, cards like the Chase Ink Plus, Southwest Airlines Premier, and the American Express Platinum offer huge bonuses between 40,000 and 60,000 miles. However, signing up for cards with big bonuses is a short-term solution. If you’re looking for something that will pay off down the line, cash rebate cards like Fidelity Visa or Citi Double Cash offer a 2% cash rebate. This way, you won’t be limited to spending your rewards solely on airline tickets.